24 | March | 2008 | Through the seasons before us.. Given that today we were confounded by a Continental ‘keeper – perhaps the strange timing of signing Dimitrios Konstantopoulos isn’t so strange! We’ve apparently signed – or are about to – sign the Coventry goalie on loan until the end of the season, with him having dropped out of first team reckoning for the Sky Blues since the arrival of Coleman at the Ricoh Arena. It’s true that a decent competitior to Smithy has been a longstanding gap in our squad – with the 87 year old (sic) coach Barry Richardson standing in on numerous occasions as substitute goalkeeper, and with a likely torrid run in to the end of the season, culminating in the inevitable stress-fest that is the playoffs, having a backup incase of injury to Smith is a pretty sensible step to take. Forest done like Kuipers in disappointing home draw.. I was willing to stem my optimism that automatic promotion wasn’t out of reach if we won all our remaining games – but a gap of 11 points to Carlisle up in second place now looks insurmountable in eight games for the stuttering and inconsistent Reds. All in all, a frustrating and disappointing afternoon against a dogged Brighton side who ultimately came to get a point – even when they had a three-on-one break in the second half! That said, the Seagulls were certainly up for it in the first half – after four minutes a mix-up in defence with Wilson gifted Nicky Forster an open goal which he somehow (and luckily for us) conspired to put wide under pressure from Wes Morgan. After the shaky start Forest started to gather some semblance of composure. Commons had the chance of the half from our perspective, he did well to ride a challenge or two before eventually beating the last man and find himself through on goal – but his right-footed shot was at an easy height for Kuipers to deal with in the Brighton goal, at the cost of a corner to the Reds – it had looked easy for Kris to slip the ball under him. Tyson did well to head a Bennett cross across the goal, but Thornhill could only strike the post at a tight angle rather than actually hitting the target. Tyson was looking fast and dangerous but the Seagulls took advantage of a soft referee and basically took him out at will – eventually one such ‘challenge’ on the striker warranted a booking. A header from Chambers was planted well, but unfortunately straight at Kuipers – the ball rebounding to Chris Cohen who also couldn’t defeat the big ‘keeper. Again, Commons managed to wriggle free in the box after good work from Ormerod and Thornhill, but the goalkeeper was again equal to it and made the save to concede another corner. Brighton finished the half with rare forays forward and could’ve taken a cheeky lead with a corner in the closing minutes of the half, an effort from Elphick (amusing referred to as Michael Elphick on Radio Nottingham on the way home – his name is Tommy!) which forced Smith into a rare save, tipping it onto the crossbar. At half time I made the call without much argument from my neighbours that it was going to finish 0-0. Forest had looked good in spells, but their end-product was atrocious and the weight of expectation would only make that worse as the game goes on. Brighton were really only interested in defending and hitting us on the counter-attack, so didn’t appear to pose much threat going forward. The second half again started with the Reds rolling out the red carpet for Brighton to attack, but quickly we picked up possession again and eventually forced a corner with which Commons found Bennett who flicked on to the back stick where Thornhill missed the gaping goal from four yards by volleying over the bar – the writing was pretty much on the wall from this point. Morgan headed well from a Commons freekick, but again the Seagulls ‘keeper was alive to the threat and made a diving save to the right to give us another corner. I suspect this was the ‘worst corner in the world’ moment, a terrible short corner from Clingan to Commons was eventually lost and cleared without so much as an attempted cross into the box. Brighton continued with a series of playacting in order to falter our play, and eventually Clingan did play the ball out to the outrage of the home crowd, only for the player writhing on the floor in agony to hop up in a sprightly manner and carry on as though nothing was wrong – naturally Brighton returned the ball to us by hoofing it back to Smith. Ormerod did everything right until the shot, making a great run before hitting a scuffed effort straight at Kuipers. It was clear that we weren’t looking likely to break down a dogged and defensive Brighton side, so Smoulds made a double-substitution bringing on McGugan and McCleary for Thornhill and Chambers. The ‘four four two’ formation of the first half (without anyone on the right wing, of course) was now a three-five-two with McCleary on the right – and to be honest, it looked just as disjointed as before with no real shape to the midfield at all, and the players seemingly uninterested in making play easy for each other by making space or even moving on occasions! In a rare moment of brilliance in the half, Lewis McGugan did brilliantly to beat a man on the edge of the box and unleash a terrific shot that finally saw Kuipers beaten – unfortunately the woodwork denied him as the shot struck the inside of the post and headed across goal in agonising fashion before being cleared to safety. 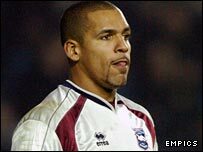 The final throw of the dice from Smoulds was to bring on ‘couldn’t look less interested without not being there’ Junior Agogo for Cohen, at this point the Seagulls had practically everyone behind the ball and Forest had neither the guile nor effort to break them down. Even on the break Brighton were more interested in taking the ball in the corner than trying to get a winner. As the fulltime whistle went the away side celebrated their achievements whilst the home fans and players were probably forced to finally concede that there isn’t a hope in hell of us reaching Carlisle now, and the playoffs is about the best we can hope for. A frustrating afternoon indeed for all concerned with Forest. Brighton are coming to town..
It’s a pretty important game, this – indeed, I don’t think we have a game left this season that can’t be considered important. To get automatic promotion, we have to basically win pretty much all our remaining games, in so doing there’s the chance we can make up the 9 point gap between us and Carlisle, and the smaller 5 point gap to Doncaster. So, with that in mind we need to be building on the excellent – if fortuitous – result at Sixfields on friday with another win here. Brighton are only four points behind us having played a game more, so are definite playoff contenders – and also travel to the City Ground on the back of a win, against Swindon at the Withdean stadium. In 12 previous meetings at the City Ground, Brighton have never won – managing to draw 3. Perch is obviously suspended for this fixture after the well documented egomaniac and incompetent referee Rob Styles red carded him for a tackle in which he appeared to win the ball – that said, it’s not the end of the world (except for being bloody annoying) since Perchy injured himself in the tackle and is still being assessed for the extent of the damage to his ankle ligaments. Tyson is okay, despite hobbling off against Northampton, which is great news – by all accounts he literally ran himself out of fuel at Sixfields. Commons, who made a substitute appearance, is now available again, as is Ian Breckin who was suffering with illness prior to the Northampton match – so we could see the same kind of formation, or we could see a tweak or two. 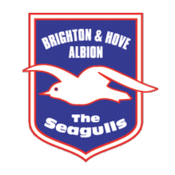 The Seagulls will be without a few key players, Whing is suspended and El-Abd and Richards are injured. However, Wes or Wilson will need to keep a close eye on Nicky Forster who is currently topping Brighton’s scoring charts after joining Brighton in the summer for a bargainous £75k. Last time out was in December at the Withdean, Tyson scored twice and – guess what – we had another harsh red card, this time it was Sammy who saw red for a ‘foul’ on Jake Robinson. Fortunately Tys had already got us two goals prior to the dismissal enabling Forest to hold on and retain a valuable three points, and some degree of false hope that we’d see a change in our away fortunes! I’m quite looking forward to it now, it seems like far too long since I’ve seen any football – even though it was only the Walsall game a little over a week ago..